When I was writing book 5 of The Gateway Chronicles back in 2012, my dear friend Christine Carr's son Bryan was fighting a battle for his life. I would take writing breaks to check Christine's blog for updates on Bryan's status, and he was often on my mind and in my prayers. In February of 2013, Bryan passed away, just shy of his 5th birthday, and I wrote a special dedication to him on the acknowledgments page of The Scroll. 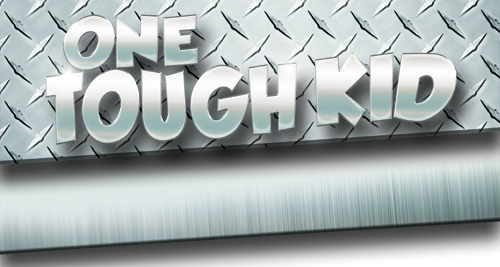 Christine and her husband, Jay, have since gone on to found a charitable organization in Bryan's memory called One Tough Kid (OTK), and I have decided that OTK will be my charitable partnership as an author. Whether it's through monetary support from book sales, special promotions to get the word out about OTK, sponsoring a team for their yearly OTK Tournament, or simply offering moral support, I hope to always be a part of their efforts in raising awareness and aid for other TOUGH Kids like Bryan. 1. When and Why was One Tough Kid founded? One TOUGH Kid was, honestly, founded on the day one of Bryan's doctors refused to encourage him for being tough and fighting so hard for his life. Everyone in the hospital room was shocked that he could say such a thing in front of such a sweet and courageous little boy who fought for nearly a year to survive the consequences of his bone marrow transplant. When Bryan passed two weeks later, I made a vow in my heart that a child should never have to experience that kind of ambivalence to their heroic struggles. Officially, however, it wasn't until a year later that One TOUGH Kid was given it's name and purpose. 2. What is a TOUGH Kid? A TOUGH Kid is a child or teen that endures unimaginable circumstances, usually through prolonged illness or a lifetime of handicaps; yet, they inspire everyone around them with their Tenacity, Optimism, Unselfishness, Gratitude, and ability to choose Happiness despite their difficulties. Amazingly, they struggle with a smile. They exemplify the truth that "Life is Worth the Fight." 3. What is the mission of OTK? At OTK, we seek to do several things: 1. Celebrate and make a celebrity of TOUGH Kids. They often struggle for or through their life with very little notice. Their stories need to be heard. 2. Educate youth and teens about the TOUGH Kid values 3. Raise funds for excellent organizations and the needs of local TOUGH Kids through fun athletic events. 4. How do you envision OTK growing as a charitable organization in the future? Our hope is that we will grow financially to see OTK's influence grow across the world. When youth, teens, and adults think a little less about their own busy lives and focus a bit of their attention on a TOUGH Kid, a magical thing happens. People complain a bit less and live their lives with more gratitude and compassion. Additionally, a child is encouraged in their own fight. They feel less lonely and experience their own sense of purpose. We could all be a little more TOUGH. Have a heart for terminally and chronically ill children?